Hi to all the dog lovers, and to everyone else - the people who haven't met the right dog yet. We hope you enjoy Chanel's site. Look around. 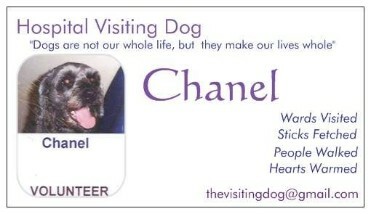 Read about Chanel's work in the 'Chanel Speaks' page . See some pics in the Picture gallery. "and ALWAYS Show your People you love them." It works for her! And for us!